oily skin and blemishes. This may be a result of the potash that gives the soap its black color. Raw black soap is often used in shaving, to help fight eczema and psoriasis. 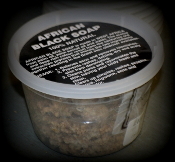 African Black soap is an ancient cosmetic cleansing product from West Africa. can be used on the face, body and hair with many therapeutic benefits.